…it’s also just been a while, yeah? o_o;;; Sorry! You can read this on Archive of Our own, if you want! Best not to think on that. My beloved servants of Hoshido—drat, no. Her legs shook, when she wasn’t careful. Despite powerful thighs built for hard effort, everyone has limits, and she had been standing in front of the huge, ornate mirror since sunup as retainers fussed over her. Though this was to be expected: the robes and jewelry of the Rite of Ascendance were intricate—every hairpin and every tie had not just a ritual method, but a ritual meaning. The fact that HER retainers insisted upon being part of the preparation, however, made the process no swifter. Azuma, once granted entry, had knelt in the corner, offered only “what is adulthood? Death, but through the eyes of others” and had hardly moved before being summarily ejected. Setsuna had somehow suspended herself from the ceiling in her first attempt to tie an obi. And Hinoka had, for the most part, fussed and fidgeted throughout the entire, day-long ordeal, thankful for the moments of distraction, when eyes were on suspended Setsuna and she could breathe without looking in the polished brass mirror that seemed to calculate and track her ongoing descent into ritual femininity. She was only too happy to let the inevitable be delayed. But it was inevitable, wasn’t it? Thus, midday came ‘round with precious little progress to show for it, and there was only one thing to do: call in professionals. 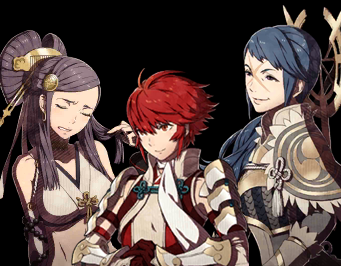 When Orochi and Reina arrived, Hinoka felt some strange relief despite herself—ah, adults! They’d handle everything. With precision and grace, her mother’s retainers went to work. Orochi flitted about her like a butterfly, pulling robes close, adjusting and creating form as a stoic Reina deftly closed these shapes around Hinoka’s body with traditional water-blessed rope and silken ties in ornate knots. That relief soon congealed into a new form of disappointment, as the robes draped and tied around Hinoka’s lithe, toned frame failed to transmute her into the emblem of beatific womanhood her mother represented. Never had she felt more childish than on this, the eve of her twentieth birthday, and her official coming out as the eldest princess of Hoshido. It was a dual, yet paradoxical disappointment: Hinoka resented these robes for what the mythical image of femininity they represented, and yet she also resented that they failed to bestow her that same image, when forced upon her. She tried to focus on her speech. Then there was the matter of the hair. She flinched this way and that as the pins and clips went in, her relative lack of experience with them amplifying a fear of being poked and prodded at the scalp. Orochi’s dexterous hands had to redouble their efforts just to ensure that Hinoka’s rabbit-like quavering did not become a self-fulfilling prophecy. Sit? Relax? Hinoka’s thighs and rump ached from standing all day, it was true, but it wasn’t a seat they craved. Her haunches yearned to spring into motion, to dash away and find her beloved mount, to take to the skies and soar—or to even pick up her training lance and whack away at a straw dummy in an empty courtyard. Anything but this! “No,” Hinoka said firmly, though her reddening cheeks (she hardly needed rouge!) and wilting gaze transmuted that denial almost into a petulant whine as it broke the air, the sound trailing into the echo of a childish do I haaaave to? Reina lifted Hinoka’s arm to tie off a thick tress in her gown, and Hinoka cleaved to her—a powerful knight of the sky, like Hinoka aspired to be—for support in this engagement. Though she did not know her mother’s retainer especially well, the blue-haired warrior hardly seemed the type to give into parlor games and court antics. If Hinoka had an ally in this plight against caked-on beauty and the encumbrance of jewelry and gowns, it was surely stoic Reina! In response to Hinoka’s plaintive look, Reina cleared her throat, furrowed her brow, and, after a moment, broke her silence. Hinoka settled down into her chair and straightened her back, attempting to assume the role of a proud and indefatigable ruler that she’d present on stage—the confident, self-assured, eldest daughter of Hoshido on the long-awaited night of her debut as an adult. The first coming out of a royal princess since long before her birth. It was fair to say the nation was in a dizzied fervor of anticipation. And still, Hinoka had only one thing on her mind… and it was hardly the make-up. The word ‘ravishing’ triggered some uncategorized and unpleasant thought in Hinoka’s mind, and the pit of her stomach sunk a little. For some reason she found herself painfully aware of her breasts, and how the tight ties of her robe seemed to emphasize the shape of her curves despite her modest bosom and the thickness of the cloth. She sighed, biting her lip and trying to relax into the ticklish feeling of Orochi’s tender brush strokes along her cheeks. Hinoka’s face made a show of shifting, both as she struggled to accept Reina’s advice and she struggled to avoid bursting into laughter at the thought of strong and scarred Reina in these ridiculously ornate robes—the latter bringing a mirthful wrinkle to her nose. She glanced between her attendants. It was a trial to keep her coltish body still, and thus, she sublimated that energy with her eyes, darting them back and forth as Reina and Orochi manipulated her like some precious doll. “The speech?” she asked. “It’s all but written for me… I’m to be proud, yet magnanimous; bold, yet gentle; fierce yet…” Forgetting herself in daydream, the young princess all but smiled, for a moment. “Head up!” Orochi chastised, playful yet stern, pushing a finger beneath Hinoka’s daydream-drooped chin, so that the light caught the eldest daughter’s cheekbones and Orochi could continue her work. “Indeed,” said Reina, with a couched smile. Reina scoffed, glancing down at Hinoka’s hair—it’d been shimmered, smoothed, pinned out of her eyes, her cropped locks given an almost feminine cast beneath the sun-emblem crown pinned precariously into the back. Feeling unsated, but slightly more at ease, Hinoka obeyed, for a time. The room fell silent but for the gentle susurration of brushes against skin and the whisper of cloth as the women committed themselves to the final flourishes of their duty. Orochi’s fingers roamed down Hinoka’s neck, gently turning her head this way and that to apply detail and contour, layer upon layer paper thin, until one could suspect that Orochi’s brushes were empty, that she was simply tormenting the girl for the delight of it. At some of these touches, chaste though they may’ve been, Hinoka would tremble a little—caught as if between conflicting desires to shy away from this strange intimacy and to throw herself bodily into it, into the skilled, yet somewhat cold, hands of the beautiful women gilding her. Her lips parted, and her breath quickened just a pace in her chest, at the thought of their proximity, and all that might entail. Through the make-up, she could feel her skin ready to bead into sweat. It was nerves, she told herself. And then, after a time, it was over. “Perfect,” said Orochi, placing the last of her brushes on the table beside her. She stepped out of the way of the mirror, and the face staring back at Hinoka was oddly intense. It was unmistakably her own, but… moreso. An afternoon of sitting, finished… and a strange woman looking back at her in the mirror. Her snub nose was adorable, demure, her lips plush enough to pout, but set firm. The liner on her eyes seemed to focus the gaze on that part of her face, as though she were sizing up an opponent. In one moment, a delicate princess; in the next, a ferocious warrior. But undeniably feminine throughout—indeed, it was a cocksure, headstrong femininity that Orochi had drawn out, uniquely Hinoka in every way. Hinoka raised her hands to touch her face, as if to confirm it still belonged to her. The warning halted the princess full stop, and Hinoka hastily bused her hands cupping each other in her lap. With grin unfaltering, the fortune-teller folded her hands, faux-demure, between her breasts, providing room for Hinoka, in her robes and crown, to stand and lead her new procession.Hinoka stood with uneasy, affected grace. The wooden sandals were uncomfortable to walk on, and she yearned from the constrictive comfort of her riding boots. The sun sigil crown pinned to her short hair and the yards of cloth wrapped around her were heavier than any armor or helmet upon her shoulders and head. Though the robes draped wide around her form, they pulled dramatically tight around her legs, so she could only shift forward in meager steps, when her body craved its usual loping stride. To one so accustomed to soaring freedom, such demure shuffling barely seemed like movement at all. Hinoka had managed to avoid robes like this for many years—since the sakura festivals of her youth. Since those days of blooming flowers, she had bloomed too, followed a path she might never have expected, and grown into a woman—and these robes had only grown more constrictive in their absence. …and only as she reached her chamber’s sliding door, and the murmurs of the waiting crowd of retainers, servants, maids, and attendants reached her ears, did she begin to shake. “I can’t,” she said, with quiet urgency, turning to appeal the inchoate procession of two behind her (indeed, their presence could only remind her of how many more were waiting to join in the hall outside, and had been for hours). Reina and Orochi looked to her, then to each other. “I can’t,” Hinoka said, simply. She wasn’t ready. There had to be someone else who could do this. Anyone would do. “Sakura,” she spoke to herself, in a pained whisper. There had to be another princess of Hoshido who could do this—anyone but her. Another odd, shared glance passed between Orochi and Reina. Reina nodded, eliding past Hinoka with a watery grace, and stepping into the hall as befitted Hoshidan Guard—that is to say: protectively. The door opened, the small crowd came alive at even the brief glimpse of the princess in her formal garb, some of the younger servants—many of them young enough to have never seen a princess at her debut—going as far to crowd the door in the excitement. It was no secret, of course, what was missing from Hinoka’s heart, and as Reina addressed the mass, so Orochi took the Princess by the shoulders, kept her upright, her robes and makeup and spirits in order. But even as she spoke these confident words, Orochi internally faltered. She’d never been so close to the Princess, and never noticed the litheness of her, the muscle. With her eyes, perhaps, as she tied and measured; but never pressed against her like this, with such immediacy. Like the sun from behind a cloud, Princess Sakura emerged, her robes emblazoned, characteristically, in white, red, pink—those of a priestess in training—and the corridor fairly sparked with resplendent cherry blossoms as she hurried to her sister’s side. With that smile, with a hug and a hopeful tug of the hand, Sakura beckoned the older princess forward, and Orochi released her, with some regret, under Reina’s watchful gaze. Her thoughts cleared, and she felt the vacuum within her fill. As Hinoka faltered before Sakura’s fearsome wave of compliments, looking away and descending into stammers and blushes, beneath her breath Reina spoke to the fortune teller. With that, Orochi closed the sliding door behind them, and the two attendants followed the procession to the great courtyard and the banquet.